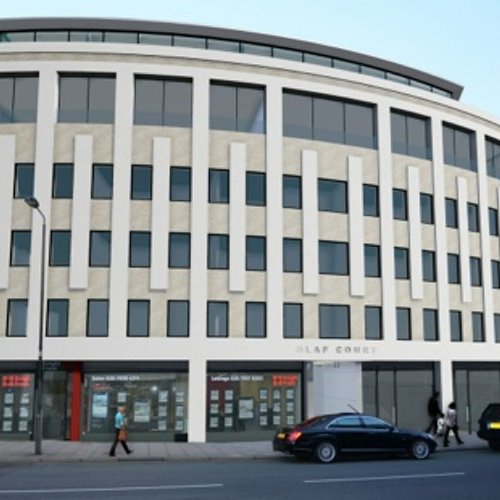 Olaf Court is a flat roofed four storey building consisting of 6 retail units on the ground floor and 12 apartments over the three upper floors. It is within the Kensington Palace Conservation Area and was constructed in 1962 of reinforced concrete framework and external precast concrete panels and single glazed windows. The rear has exposed framework and infill brickwork. The building has been reasonably well ‘maintained’ but no improvement work has been carried out since it was constructed. It is now ‘dated’ and detracts from the conservation area. The common parts are dark and uninviting. There is no wheelchair access and the Lift is continually out of order. Windows have poor thermal and noise insulation qualities. Using our team of award winning architects Pirton Limited has designed a scheme to add a further two floors of one large apartment and a stunning Penthouse. In addition to the new work the whole building is to be transformed. The front facing concrete panels are to be covered with natural stone panels and new windows fitted. The main entrance is being altered and the internal steps removed. A new larger Lift is to be fitted and the common parts refurbished. Incoming services are to be improved.